I was quite surprised how many times the Grieg and Sibelius String Quartets have been yoked on disc. Apart from what some perceive as a permeating ‘Nordic sound’, what is more definite is that each composer left only one mature work in this medium, despite some early attempts. I found two recordings in my collection featuring the two works: the 1989 recording by the Guarneri Quartet (426 286), and a Biddulph recording from the 1930s with the Budapest String Quartet (LAB 098 and now in a Warner Sibelius box). The only other recording of the Grieg that I have is played by the Hagen Quartet (MYR007). 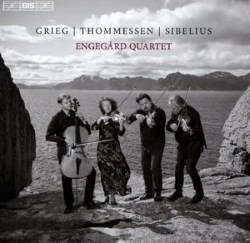 The Engegård Quartet are completely new to me, but I see that they’ve recorded the Grieg previously in 2007 for the 2L label. Grieg’s String Quartet No. 1 in G minor, Op. 27 dates from 1878 when he was thirty-five, and sits between an early student work which was lost and the third quartet which was left unfinished. In common with César Franck’s Piano Quartet of the same year, it incorporates elements of cyclical design. He borrowed from his own music, in this case the ‘Spillemænd’ (fiddlers) song from his group of Ibsen settings, Op. 25. It is announced at the beginning of the quartet in unison, woven into the fabric throughout, and makes a return in the last movement. Debussy was very taken by the work, and it influenced him to compose his sole quartet in 1893, also in G minor. The work dispels any pre-conceived notions that Grieg was at heart only a miniaturist. The chromaticism, richly textured harmonies and bold modulations certainly have a progressive feel. Grieg employs a good deal of double-stopping which creates a full-bodied, rich orchestral sonority. The Engegård’s account is intense and passionate. There’s forceful declamation in the opening chord of the first movement, which grabs your attention immediately. The many disparate elements of the movement may cause the music to meander in some performances, but not here. The players have an eye on the bigger picture, keeping a tight grip on the narrative. The Romanza which follows is generous on memorable melody, and the quartet make the contrasts between joyous lyricism and a more agitated section. The Intermezzo has rhythmic power and drive. After a slow introduction a buoyant saltarello takes centre stage. The Engegård’s delivery is alert and assured and they pack plenty of personality into their playing. Sibelius' String Quartet in D minor Op.56 Voces Intimae was composed 1908-1909 between the Third and Fourth symphonies, and is the only major work for string quartet of his mature period. It was premiered on 25 April 1910 at the Helsinki Music Institute. Its introspective character gives a foretaste of the Fourth Symphony, and its conversational tone is hinted at in the title ‘Intimate Voices’. Indeed the quartet begins with a mournful, dialogue between violin and cello establishing the general mood of the work. It was written under a pall of debt and illness and is cast in five movements. This is one of the finest performances I’ve heard, capturing the contrasting moods and emotions to effect, starting with the brooding solitude of the opening movement. I particularly like the delicate, fleeting lightness of the second movement. The Adagio is the emotional heart of the work, and the Engegårds instill heartfelt passion and yearning into their reading. The finale is restless, frenetic and dispatched with energy and gusto. Olav Anton Thommessen has, for the past thirty or so years, based his compositions on fragments of existing repertoire – in this case, Mendelssohn’s String Quartet Op. 44 No. 2. It bears the title Felix Remix and is his fourth string quartet. In it he utilizes contemporary compositional techniques, and the work abounds in glissandi and harmonics. Mendelssonian gestures interject at various points. The Engegård’s technically virtuoisic rendering evoke the galloping of horses and steam locomotives, aural images the composer intended. It provides a fascinating nine minute diversion. This new recording is an improvement sound-wise on the Guarneri Quartet, which sounds a tad congested at times, and I also found these newcomers more considered in their approach. The Hagens, in the Grieg only, are wonderful and will act as a pleasing alternative. The Budapest Quartet likewise offer compelling accounts of the Grieg and Sibelius, albeit in 1930s sound. The BIS engineers have done the Engegårds proud in achieving superb balance between each instrumentalist. The acoustic of the Bryn Church, Bærum, Norway couldn’t be bettered, conferring a warm, intimate ambience with just the right amount of resonance. Tomas Block’s liner contributions in English, French and German are well-written and informative. Altogether a charming disc.